The feast day of St. Martins is held on Wednesday the 11th of November, and this presentation on him was delivered the following Sunday. In light of the tragic loss of life in the wake of brutal terrorism in Paris that transpired recently, it is fitting to consider the testimony left to us of St. Martin of Tours, who is held as a patron saint of France. He was bishop in Tours for some thirty years, and his brave military service and commitment to compassion and peace inspires us to place our final hope in the irresistible grace of Jesus Christ, not in the promises of politicians or weapons of war. The Life of St. Martin was composed by Sulpicius Severus, who not only lived in St. Martin’s time, but also spoke with those who witnessed his Christ-centered life and even interviewed him personally in the process of writing Martin’s hagiography. This brief summary is therefore based primarily in Severus’s depiction of the saint. It is a remarkable life – by the grace of God, St. Martin served in the Roman army, then entered clerical orders, debated with the Devil and spoke with angels, performed numerous miracles, showed compassion to those in poverty, and even converted a robber to Christianity after that robber had kidnapped him and held him hostage. St. Martin’s close relationship with the Lord began at the age of 10, but at 18 he was required by law to enter military service. While on duty in the dead of winter, he saw a poor man on the side of the road dying from the extreme cold. Despite the fact that his service would keep him in the cold as well, Martin took pity on the man, and used his sword to cut his own coat in two. He gave half of the coat to the man, saving his life, and then endured the mockery of his fellow men at arms for how foolish his half-coat looked. This fearless commitment to God’s calling marked St. Martin’s incredible ministry. By Severus’s account, the Holy Spirit granted Martin the ability to see the Devil in whatever form he was present. When the Devil threatened him that he would resist Martin at every turn, he replied, “The Lord is my helper; I will not fear what any can do unto me.” And the Devil fled from him. During his ministry as Bishop of Tours, St. Martin confronted pagans who were worshiping an ancient pine tree, exhorting them to cut their idol down. They agreed on one condition: that Martin would show faith in his God by standing in the path of the falling tree. 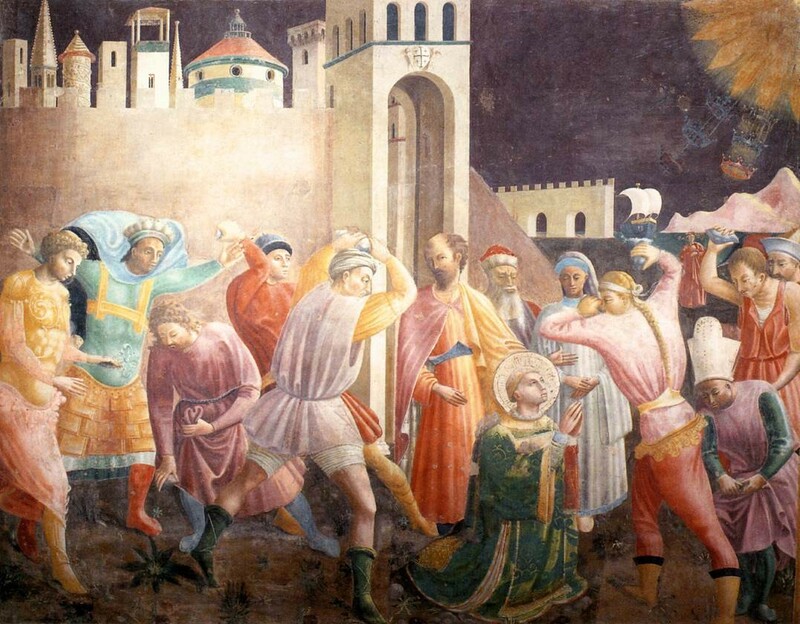 With his terrified followers watching, St. Martin stood as the pagans felled the ancient pine. As it rushed towards him with deadly speed, St. Martin made the sign of the cross, and suddenly the tree spun and fell harmlessly to the side. Many of the unbelievers there, amazed, committed themselves to Christ that very day. Like St. Martin wearing his half-cloak, we may be mocked by wearing the outward sign of our Christianity. We should not shy from the conflicts of spiritual warfare, but we should, like St. Martin, starkly separate the practical necessity of military service from the peaceful sharing of Christ’s Gospel. When we put our steadfast faith first in the help of the Lord, not in mortal shields and helmets, then we can share in the compassion and confidence with which St. Martin, by the grace of God, encountered the perils of the world. As we pray for Paris and Beirut and any others who endure the dangers of terrorism, we must remember with gratitude the sacrifice of those in the military who strive to keep their fellow citizens, whether Christians or non-Christians, safe. In both times of peace and of war, Christians must always share the Gospel peacefully and with confidence, remembering that true peace comes not from government, but from God.